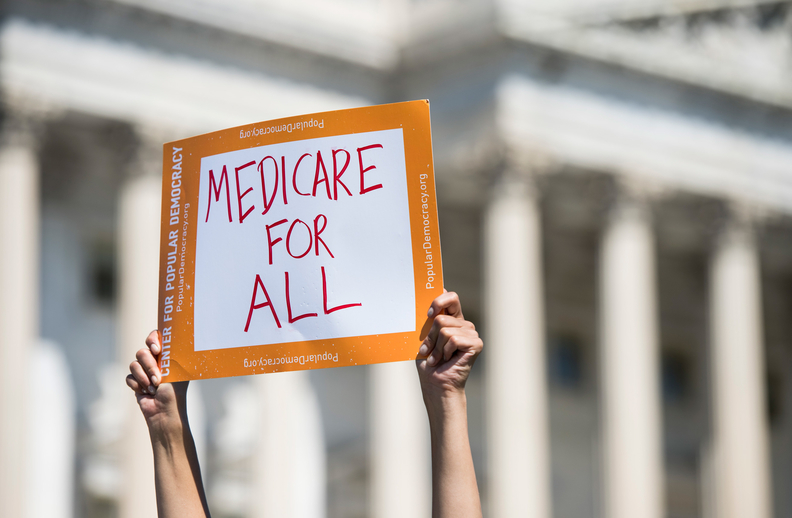 A draft version of House Democrats' upcoming Medicare for All bill proposes a national system that would pre-pay hospitals with lump sums while keeping a fee-for-service model for individual physicians. The regional directors would then negotiate each year with the facilities to set a lump sum, or global budget, that the government would pay out in advance to all institutional providers. These include hospitals, nursing homes, federally qualified health centers, home health agencies and independent dialysis facilities. The negotiated budget would be based on several factors, including the provider's three-year history of expenses and maximum capacity for patients, as well as staffing requirements. The existing prospective payment system would serve as the baseline rate to jump-start the global budget negotiations. Once the budget is set, hospitals and other institutions would need to stick to it for all outpatient and inpatient treatment. However, this budget would also be up for review by the regional director four times a year. "The regional director, on a quarterly basis, shall review whether requirements of the institutional provider's participation agreement and negotiated global budget have been performed and shall determine whether adjustments to such institutional provider's payment are warranted," the draft bill said. Some physicians, including those in certain group practices, could opt to receive a salary from a hospital or other provider subject to the global budget. Individual physicians, including those who belong to group practices and don't opt for a salary, would be paid through fee-for-service according to a fee schedule set by the HHS secretary. Like the institutional providers, physicians wouldn't be allowed to charge their patients anything for their care. The HHS secretary would need to update the fee schedule annually. The idea of global budgets has been circulating in policy circles around discussions about rural healthcare. Last year, a key Senate panel discussed a global budget model for Medicare as a way to boost struggling rural hospitals. Like the Sanders bill, Jayapal's proposal lays out generous benefits without any cost-sharing, as well as sweeping authority for the HHS secretary. Emergency transportation; prescription drugs and medical devices; mental health and addiction treatment, including for inpatient stays; laboratory tests; dental and vision care; podiatry; and even dietary and nutritional therapies as approved by the HHS secretary would all fall under the law. A spokesperson for Jayapal did not respond by deadline as to the status of the Jan. 14 draft. Jayapal has said she expects to introduce the bill as soon as next week. As hype ramps up among progressives for Medicare for All ahead of the 2020 presidential election, House Speaker Rep. Nancy Pelosi (D-Calif.) has committed to hearings on the policy this Congress. She has also tapped Rep. Brian Higgins (D-N.Y.) to lead Medicare buy-in legislation, according to her spokesman Henry Connelly. "For the first time, House committees will be seriously examining and tackling some of the questions and possible solutions raised by Medicare For All legislation," Connelly told Modern Healthcare. The preamble to the legislation lays out the pitch for the broad national system, including the statistic that 29 million remain uninsured after implementation of the Affordable Care Act. Of the insured, 43% "have difficulty meeting their deductible and approximately one-third say they find premiums and other cost-sharing unaffordable," the draft bill states. The legislation goes on to detail industry profits, citing a single year's data showing nearly $20 billion in profits for insurers, $125 billion for the 20 largest drugmakers and $15.2 billion for for-profit hospitals.